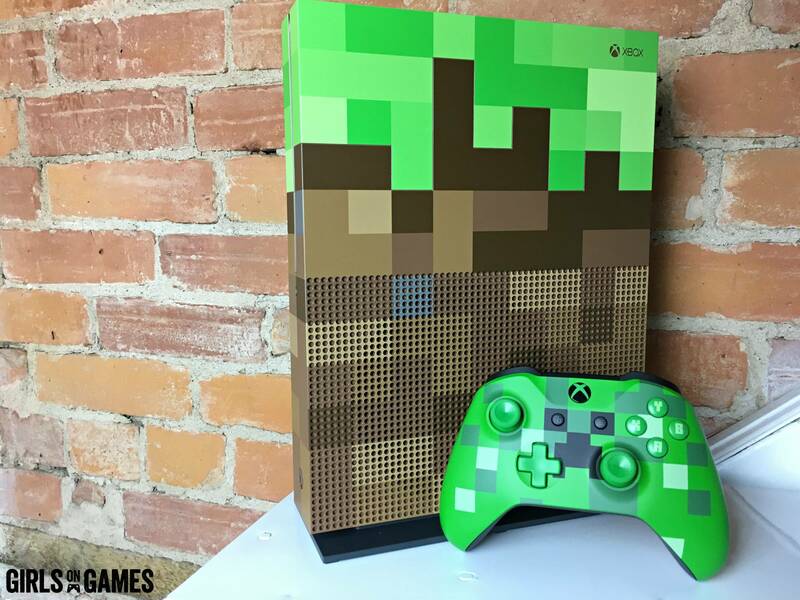 The Limited Edition Minecraft Xbox One S has been released, and anyone who knows me can confirm that I am a HUGE fan of Minecraft. 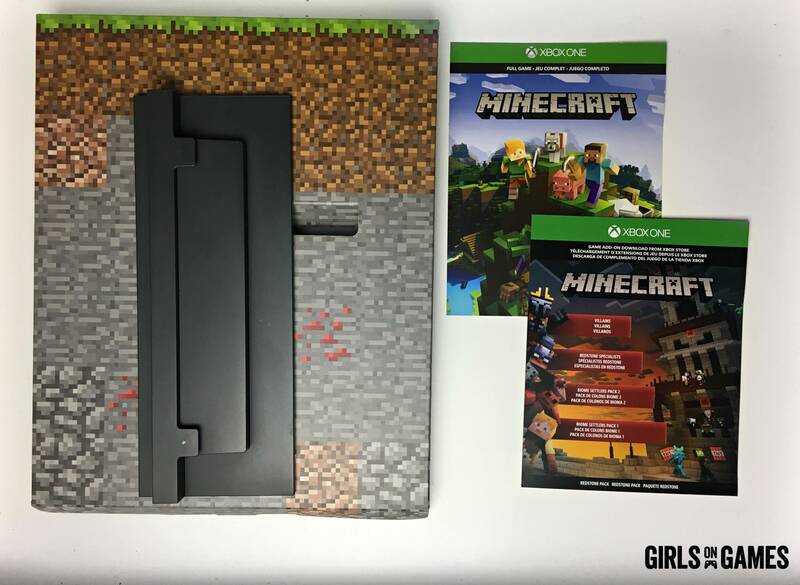 When the Limited Edition Minecraft Xbox One S was revealed back in August, I was screaming with excitement! I just had to get my hands on this console and see the masterpiece in person. Is it worth digging up? Let’s see what’s in the box and find out if this console is worth the explosion! The “pièce de résistance” of this bundle is definitely the Limited Edition custom console. It’s a standard Xbox One S with a 1TB hard drive, and built in 4k ultra HD blu-ray player and 4k video streaming. 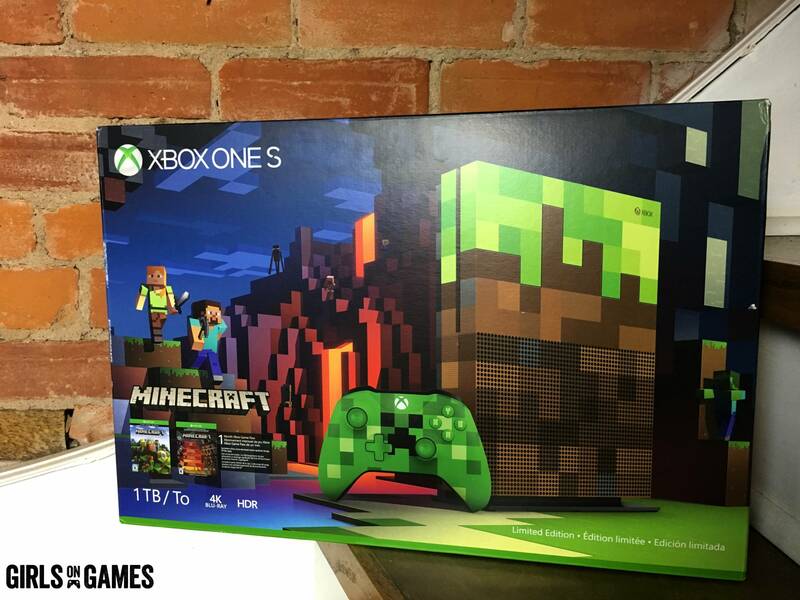 However, the design is what makes this console Limited Edition as it looks like the infamous Minecraft dirt block. Although the front of the console is pretty awesome, the back is where all the surprises lie. A transparent cover that is filled with redstone circuit accents cover the whole back piece. These redstone circuits truly make this console feel like a work of art. 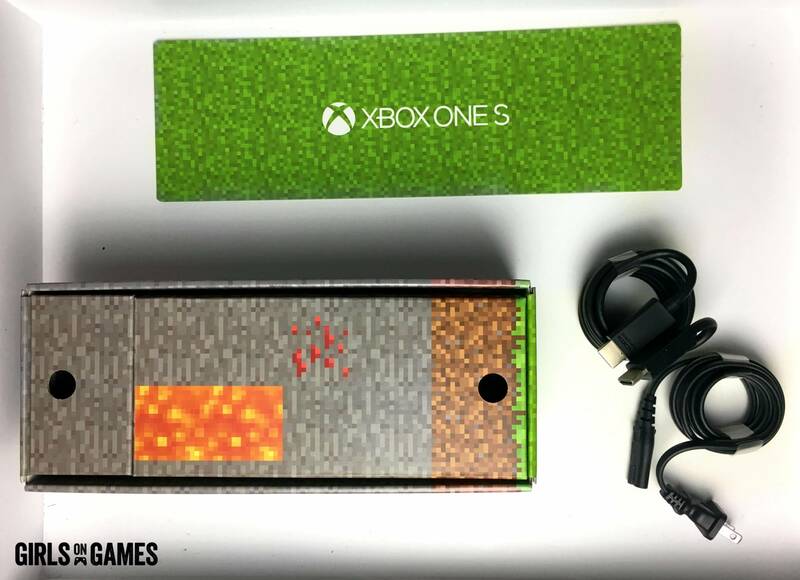 Alongside the Limited Edition Minecraft Xbox One S they also released two Minecraft themed controllers: a pig and a creeper, the latter included in the bundle. The creeper controller is your standard Xbox one controller with an awesome creeper skin on the front, and a little TNT block on the back. This controller has custom button mapping, and up to twice the wireless range. This is one creeper you definitely don’t want to explode! Those redstone circuit accents weren’t meant to be hidden – show them off with the included vertical stand! To buy the vertical stand alone it retails for around $30 CAD – so this is definitely a great bonus to this console bundle! I’ve never used the vertical stands for any of my former consoles, however the Limited Edition Minecraft Xbox One S is like a work of art, and I’m proud to have it on display! Of course the bundle includes the game itself. If you haven’t yet played the Xbox version of Minecraft, it is very similar to the Windows 10 version with some slight variants in inventory/recipe design to help with controller users. If you’re new to Minecraft in general, you’re in for a treat! Minecraft is a MASSIVE sandbox game that allows the user to explore mass amounts of land and build whatever they please. If you’re not much of the builder type, the game also has mini game servers, adventure maps, and even a story mode, but keep in mind that some features may have additional costs. This is such a great game for all ages and provides hours of entertainment. On top of the full game, they have also provided the Redstone Pack which includes some awesome skins to dress your character! These skin pack add-on’s include Villains (a skin pack filled with monstrous villains), Redstone Specialists (Mad scientists, and other creators), The Biome Settlers Pack 1 (Forest, Tundra, and Desert settlers – great to match your character with the biome you choose to build in) and finally the Biome Settlers Pack 2 (a skin pack that includes more nether themed workers such as brewers, engineers, brawlers and archers). Some of these packs also include unique biomes which add even more excitement to the game! I love free samples and trials! The box includes a one month trial to Xbox Game Pass which gives you unlimited access to over 100 Xbox One and Xbox 360 titles. This is such a great way to relive some of your favourite games from past generations. On top of the month game pass trial they also included a 14 day trial to Xbox Live Gold. Xbox Live Gold allows you to play online with your friends and to use the ‘better together update’ for Minecraft which allows you to play with your friends across platforms! Whether your friends are on Windows 10 or Xbox, you’ll all be able to create new builds on the same world! Last but not least, the box also includes your standard HDMI cable (4k capable) and an AC power cable! Is It Worth The Explosion? The Minecraft Xbox One S ‘exploded’ like TNT throughout the interwebs with excitement and awe. As a Minecraft enthusiast, this Limited Edition Xbox One S is 100% worth picking up. Although the generic Xbox One S is sufficient as it is, there is something about owning a piece of console history and getting your hands on a Limited Edition Xbox! The Minecraft edition is around $50-$100 more compared to the basic 1TB Xbox One S, which isn’t too bad in my opinion. If you’re a Minecraft enthusiast yourself, or have a Minecraft fan on your Holiday shopping list, I would highly recommend you opt for the Limited Edition Minecraft Xbox One S! DISCLAIMER: Xbox review unit was provided by Xbox Canada. The opinions expressed in the article above have not be affected by, dictated or edited in any way by the provider. For more information please see Girls on Games’ Code of Journalistic Ethics. Next ArticleGirls on Games’ Geeky Gift Ideas for 2017!